9 For this reason we also, since the day we heard it, do not cease to pray for you, and to ask that you may be filled with the knowledge of His will in all wisdom and spiritual understanding; 10 that you may walk worthy of the Lord, fully pleasing Him, being fruitful in every good work and increasing in the knowledge of God; 11 strengthened with all might, according to His glorious power, for all patience and longsuffering with joy; 12 giving thanks to the Father who has qualified us to be partakers of the inheritance of the saints in the light. 13 He has delivered us from the power of darkness and conveyed us into the kingdom of the Son of His love, 14 in whom we have redemption through His blood, the forgiveness of sins. 18 While He spoke these things to them, behold, a ruler came and worshiped Him, saying, “My daughter has just died, but come and lay Your hand on her and she will live.” 19 So Jesus arose and followed him, and so did His disciples. 20 And suddenly, a woman who had a flow of blood for twelve years came from behind and touched the hem of His garment. 21 For she said to herself, “If only I may touch His garment, I shall be made well.” 22 But Jesus turned around, and when He saw her He said, “Be of good cheer, daughter; your faith has made you well.” And the woman was made well from that hour. 23 When Jesus came into the ruler’s house, and saw the flute players and the noisy crowd wailing, 24 He said to them, “Make room, for the girl is not dead, but sleeping.” And they ridiculed Him. 25 But when the crowd was put outside, He went in and took her by the hand, and the girl arose. 26 And the report of this went out into all that land. Today we are given two parables of faith in Jesus. The first parable, Jairus’ daughter raised from the dead, is broken into two parts with the second parable, the healing of the woman with a flow of blood, in the middle. Let us pray: O Lord, who works faith in sinners by means of You working Word, grant us the faith to receive what you have to give us today; in the name of Jesus. Amen. KJV Matthew 9:18 While he spake these things unto them, behold, there came a certain ruler, and worshipped him, saying, My daughter is even now dead: but come and lay thy hand upon her, and she shall live. 19 And Jesus arose, and followed him, and so did his disciples. This miracle set is found in all three Gospels, so we can see the importance of knowing and understanding both healings. The first is the ruler’s daughter. We should not overlook the fact that this was the daughter of an important official, one known by many. In some cases the entire crowd witnessed the miracle. In this case, the immediate witnesses of the miracle were few, but the entire circle of friends and associates, plus many more, knew of the ruler’s problem and participated to some degree in the actual mourning ceremonies. Those who laughed at Jesus were just as important as the trusting family, since they were rudely shaken in their assumptions, of life and death, of who Jesus is. They were not laughing at a country bumpkin but at the Son of God, who raised the girl from the dead. The faith of this ruler is infinite, since he assumed in his trust, that Jesus could take his beloved daughter from death to life again. What weakens us more than death itself? What can be done but mourn? Most people would have hoped for healing but given up at this point. But the ruler trusted Jesus so much that he said, “My daughter is already dead, but lay Your hand on her and she will live.” In some instances, Jesus did not travel to the sick or dying person. But He did this time, and that meant the sermon of Jesus’ power went with Him. 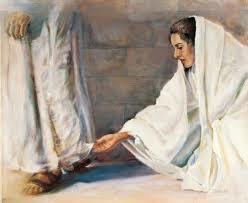 On the way, a woman came up behind Jesus and vowed she would touch the hem of His robe. Her condition was equally devastating. Because of the issue of blood, she was ritually unclean and could not be touched – for 12 years. The more she sought help from doctors, the worse she became. She should have been despairing in her inability to find any healing or comfort. She is a good example of those who have less and less and yet their faith grows and grows. She trusted in Jesus so much that she did not even think to ask him face-to-face. How could she? She was ritually unclean. She did not think to ask Jesus to touch her with His healing hands. But she was certain that touching Jesus’ garment would alone be enough to heal her. And she experienced immediate healing when she did. Likewise, Jesus knew what happened and said so. It is difficult to imagine faith being anything but good, when Jesus said, “Your faith has healed you.” Faith is like a beggar. Empty hands offered to Jesus; like a beggar; like Jairus’; like the woman. Faith receives what God gives. Luther explains it well. He often preached on this theme. The Gospel is not for the rich, powerful, and self-satisfied. They are like pigs looking at the sacrament. They devour it and do not know what they are consuming. But they have no use for its comfort, since their comfort comes from worldly peace – having power, honors, and an excess of wealth (mammon). They worship these worldly signs of peace and not God. However, the Gospel is a great comfort to those who are suffering. They feel the weight of their sins – but rejoice when they hear the simple Gospel being for them, also. They have bodily pain and disorders, so they value spiritual comfort that much more. And the great torment of all is emotional, which no one can see. Luther suffered terribly because of his great intelligence and his tender emotions. Others suffer from no temptation because they do whatever they want, until converted. But Luther was chosen by God to separate the Gospel from the Roman Catholic distortions of it, so Satan violently attacked Luther through his emotions. In seeking Gospel peace he wrote an enormous amount of material that still gives peace to people today. Jesus did not scorn woman as unclean but praised her faith. His grace and love were so great that Jesus drew large crowds wherever He went. His enemies saw that. They were jealous and plotted revenge – all for the glory of God, of course. 23 And when Jesus came into the ruler's house, and saw the minstrels and the people making a noise, 24 He said unto them, Give place: for the maid is not dead, but sleepeth. And they laughed him to scorn. 25 But when the people were put forth, he went in, and took her by the hand, and the maid arose. 26 And the fame hereof went abroad into all that land. Jesus continued on His journey to Jairus’ daughter. The professional mourners were making a racket, so Jesus kicked them out, giving them a morsel of the miracle to come by saying “The maid is not dead but sleeping.” They mocked Jesus with their laughter. That is always worth considering. The same type of person who would laugh at the Savior (who was about to save a life) will do far more than that to us who are frail, sinful humans. When they laugh at us, they are laughing at Jesus and the Gospels. Why did Jairus accomplish so much for his daughter? He trusted God could accomplish this great miracle, a miracle beyond consideration for most people. Certain the Gospel had already reached Jairus and had its effect on him. Finally, you also trust that Jesus can raise the dead, even Himself, a miracle also beyond consideration. And yet Jesus is raised from the dead. You have the faith to receive Christ’s body and blood for your healing, which in this case is the forgiveness of your sin-sickness and, soon enough, your resurrection from the dead; in the name of the Father and of the Son and of the Holy Spirit. Amen. The peace of God, which passes understanding, guard and keep you in Jesus Christ, Our Savior. Amen.